New resource offers detailed and advanced guidance on selecting the appropriate E/M codes, with helpful resources designed for difficult E/M coding situations. Includes review of E/M rules and protocols, and E/M template examples for EMRs promote accurate code selection with guidelines, and key factors for proper E/M code selection. Advanced guidance on E/M code values for EMR and evaluational documentation systems. 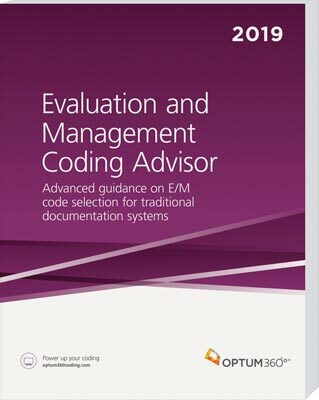 Evaluation and Management (E/M) coding is notoriously difficult because coders have trouble selecting the correct code from among a range of seemingly appropriate choices. Consequently, providers make more mistakes with E/M coding than coding for any other item or service. This new resource offers detailed and advanced guidance on selecting the appropriate E/M codes, with helpful resources designed for difficult E/M coding situations. Compliance guidance, checklist, and worksheets help avoid costly revenue take-backs. ICD-10-CM code assignment hinges on the quality and detail of E/M encounter data. Get appropriate ICD-10-CM coding assignments with improved E/M coding process. Minimize physician queries and prevent delays in claims processing pending information and stop outright claims denials. Includes clinical case studies. Train coders and clinicians using real-life scenarios. Telemedicine services. Understand how E/M services are reported. Chapter addressing HCPCS codes. HCPCS types of services now in one chapter. Covers every E/M service. Review of the E/M rules and protocols. Helpful advice designed for difficult E/M coding situations. Well-patient exams, H1N1 flu, and other common, but problematic coding scenarios are explained. Targeted areas. Review what auditors are targeting, such as critical care.